Many people opt to meet in public when going on a date with someone new. It’s a smart choice — especially if you meet online — but it still doesn’t ensure your safety. There is the benefit of having people around, but other patrons aren’t paying attention to your date and whether or not you feel comfortable. Not to mention, all bets are off once you leave. 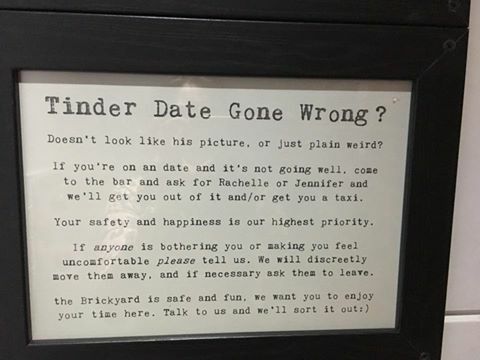 The proprietors of The Brickyard, a bar in St. Albans, England, realize that and posted a sign offering to help women get out of a bad situation, no questions asked. The sign has since gone viral, but staff at The Brickyard didn’t expect it — they just want to make a comfortable environment for everyone. “A sign that was designed purely for the safety of our female customers has caught the eyes of thousands (all genders!) and you have all touched our hearts with your support, so thank you for this,” a staff member from The Brickyard told Metro UK. Next up for The Brickyard? A similar safety campaign for men, because people of all genders deserve to feel safe. Let’s hope other bars follow suit.